Dakota Stamm of Archbold, right, chases down a loose ball Tuesday in a Division III girls soccer regional semifinal versus Lima Central Catholic. 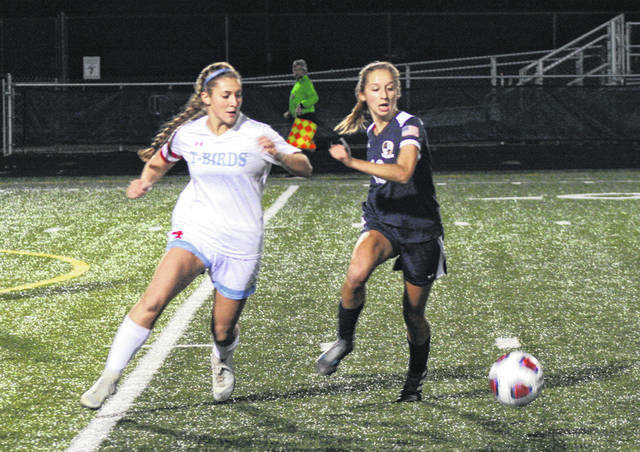 The Bluestreaks advanced to the regional final by defeating the Thunderbirds 2-1. Macy Peterson of Archbold prior to putting a shot on goal during Tuesday’s regional semifinal. Archbold goalkeeper Reagan Kohler deflects a Lima Central Catholic free kick. 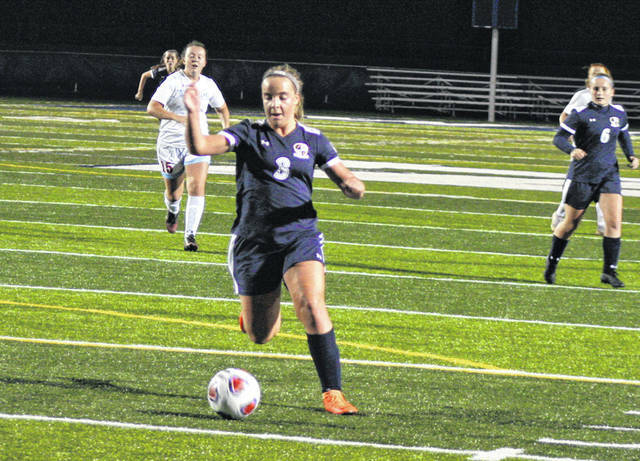 NAPOLEON – Bound and determined to get another chance at advancing to state after falling short last season, Archbold will have that opportunity after defeating Lima Central Catholic 2-1 in a Division III girls soccer regional semifinal Tuesday in Napoleon. Regan Ramirez got free for the Streaks and fit one in over the head of Thunderbird goalkeeper Kitt Siatkosky to give them the lead near the halfway point of the second half. They nearly got on the board two minutes prior thanks to a shot from Macy Peterson. At the 22:16 mark, the sophomore beat Siatkosky to a ball but her shot banged off the left post. Still on the attack, Archbold’s Chloe Nofziger fired one from 25 yards away that found the back of the net, making it 2-0 with 7:55 to go. According to Kidder, it was eerily similar to another big shot in program history. However, although Nofziger’s goal seemed to be the clincher, the Thunderbirds refused to go away. 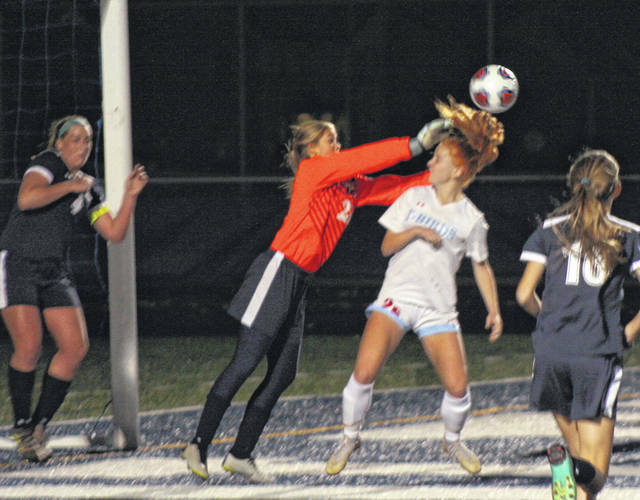 Avery Rice drew a corner kick with around four minutes to play, and her shot was on target where it was redirected into the net by Bluestreak keeper Reagan Kohler who attempted to punch it out. The freshman keeper was vital in keeping the Birds off the board in the first half. Most notably, when she knocked away Rice’s free kick with 9:20 to go. It will now be a rematch of last season’s regional final as the Bluestreaks take on Liberty-Benton this Saturday at a time yet to be determined. The Eagles advanced with a 2-0 win over Eastwood.